A tag allows you to label content or web pages with words or phrases that make sense to you. When you use SharePoint Online, part of the Office 365 suite of products, you can share your tags with colleagues and improve collaboration by allowing others to find out more about your interests and the projects you are working on. Notes are the equivalent of posting something on your friend’s Facebook Wall. You can ask a question, congratulate someone for a job well done, or comment on a project. Depending on the user’s preferences, the person you left a note for may also be notified of your note by e-mail. Notes are visible to everyone in your organization; people can see notes you leave for a colleague whether they follow you or not. When you share your thoughts about an article, a page, or a person, be mindful of the potential impact. Just as you would not post photos on Facebook that you don’t want to come back to haunt you, don’t post notes that violate your company’s policies. Content and pages you tag and annotate are displayed in the Tag and Notes tab in the My Profile page. Within that tab, you can refine the display alphabetically, by type, or by size. Your tags and notes are also displayed visually in a tag cloud. The size of the tag is displayed according to the usage frequency. On the page you want to tag, click the Tag and Notes button at the top right. The Tags and Note Board window appears. 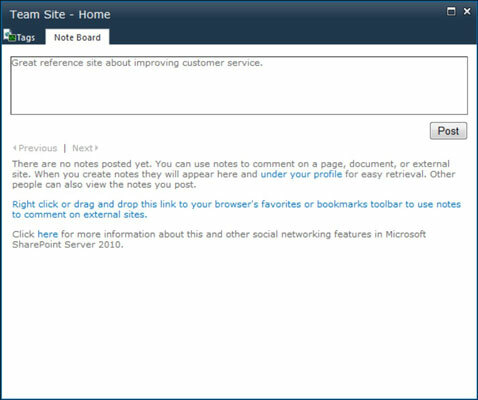 Navigate to the Note Board tab and enter your notes in the text box. Tags and notes are not limited to just your internal SharePoint sites. You can also use this feature for any website. You can install the Tag and Note tool into your Favorites toolbar for easy access whenever you come across an interesting site. The easiest way to use the tool is to add it to your browser’s Favorite bar. Instructions for adding the tool are in the Tag and Notes tab in the My Profile page. When installed, click the tool whenever you come across a web page you want to tag. The tool behaves as if you were tagging an internal SharePoint site with the Note Board.